Old and new structures blend together within this Scottish park, where a maze lies in the shadow of a ruined medieval castle. The labyrinth, although modern, looks dramatic against the backdrop of the ruins. The maze was built a decade ago after the community received a grant from a Millennium Funding Project. Locals constructed the labyrinth, and it’s currently maintained by volunteers from the village and various pagan groups from throughout Scotland. The labyrinth sits just atop a small stretch of beach. Walking through the maze to a soundtrack of crashing waves is a zen, meditative experience. But the land the labyrinth sits upon was not always so peaceful. 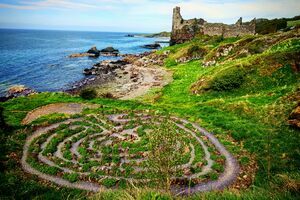 Dunure Castle, which looms in the background, has witnessed centuries of turmoil. It was the home of Clan Kennedy of Carrick. As such, it was the stage for many of their disputes. The most notorious conflict occurred in 1570, when Gilbert Kennedy, 4th Earl of Cassilis, roasted a man over an open fire for two days until the captive finally agreed to sign over some land.